If there's one colour that screams A/W 17 from a mile off, it's red. You may have noticed that red is everywhere this season, evolving from burgundy and then orange red to finally bright red of 2017. This colour will continue to be instyle and on trend for a number of seasons so it is a good time to buy it for longevity in your wardrobe and a great way to ignite your transitional one. In fact, it just so happens to the most flattering colour on all skin tones, there is a red out there for everyone whether you are Spring, Summer, Autumn or Winter colours. So as it turns out we can all wear red and all wear red lipstick, so now there is no excuse to go red alert this season. I love red, it goes really well with navy, grey and black and can also be mixed with pink for a clashing but workable colour combination. 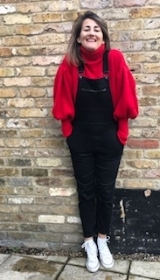 Red can be injected into your wardrobe easily with accessories such as a red belt or bag, or this season the biggest accessory to buy in red is boots. So you want to venture into the red zone, then take a look at my red picks for some shopping inspiration. Loving the sugary sweet pastel shades that are currently coating the high street but not sure how to wear it? Bask in the gorgeous Spring-like weather outside, and start planning your new season palette with my pastels trend report.